All This Buzz About a Picnic Table? You wouldn’t think of an old-style farm table as the ideal workspace for the modern office. But that’s just what Belgian designer Alain Gilles has created, in partnership with the BuzziSpace design team. The BuzziPicNic — which made its debut this year at NeoCon — is a rustic wooden structure meant to encourage collaboration and bring office design “back to basics,” according to Tom Van Dessel, co-CEO of BuzziSpace. The lunch table, an age-old symbol of community, is given new life as a tool for the modern office. All photos courtesy of BuzziSpace. How do you think the table will impact the workplace? BuzziPicNic provides the perfect collaborative desk option for any office space. It’s a versatile table that can either serve as a common eating table, a gathering point for group interactions, a temporary working space, or just as a workbench. Meant to facilitate easy collaboration among co-workers, BuzziPicNic boasts a long wooden table and can be paired with a series of BuzziBenches. The rustic structure has been modernized with electrical strips hidden inside, allowing for sleek connectivity and wire management. How does BuzziPicNic contribute to new ways of working? BuzziPicNic will typically be used in common spaces and see its function evolve according to the hour of the day and the needs of its users. The idea is of BuzziPicNic is to inspire a fun and relaxed working environment. Typically, a picnic table makes one think of the summer and good times shared with friends. It is a non-confrontational, informal gathering tool, incorporating stress-free elements to foster communication in the office. What was the inspiration behind the table? Influenced by the old-fashioned farm aesthetic, Alain Gilles designed BuzziPicNic to create the ultimate symbol of community reinterpreted for the work environment. When was it introduced to the public? All images courtesy of BuzziSpace. What do you think our readers will love about it? Readers will love that BuzziPicNic is a unique, positive approach to office furniture. 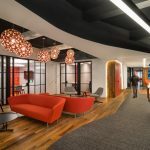 The design is meant to foster creativity and communication by providing a collaborative atmosphere, sharply contrasting a traditional office environment. For more on BuzziPicNic and other BuzziSpace products, check out their website. Marketing agency Fingerpaint brings lots of color to their new office.